Nvidia's GeForce GTX 1080 represents a major step forward for graphics cards, but the GTX 1070 may be even more impressive. Nvidia’s long-awaited GeForce GTX 1080 is real and it’s spectacular—at least on paper. If you missed Friday night’s big reveal, here are the 10 things you need to know about Nvidia’s ferocious, cutting-edge GeForce GTX 1080 and the just-as-impressive GeForce GTX 1070. The most important thing to know: This thing is fast. Ridonkulously fast. “Faster than dual GeForce GTX 980s in SLI” fast, which handily beats Nvidia’s flagship Titan X, the most potent single-GPU graphics card ever released. During a demo, the new Doom topped out at roughly 200 frames per second at 1080p resolution with all the graphics settings cranked. As I said in my initial coverage: Hot damn. Nvidia-supplied performance comparison of the GTX 1080 vs the GTX 980. Click to enlarge. 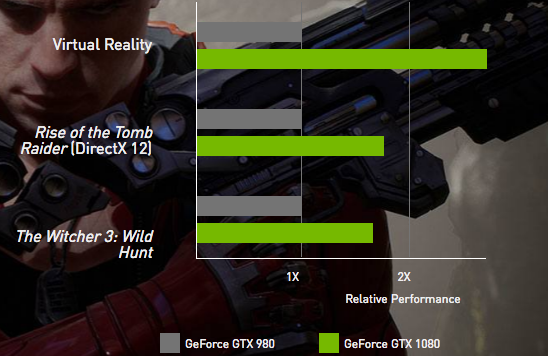 Remember how I said the Titan X is the most potent single GPU ever released? That high-water mark is the new mid-range for Nvidia’s Pascal GPU architecture. The step-down GeForce GTX 1070 outpunches the Titan X too, according to Nvidia—though it never said exactly what was being compared. The secret sauce behind those jaw-dropping performance gains lies in the adoption of several cutting-edge technologies, all at once. After being stuck on the 28 nanometer transistor manufacturing process for four long years, Nvidia is building its Pascal GPUs on the 16nm process—a two-generation technological leap. What’s more, the chips embrace advanced FinFET technology, as well as 8GB of an improved form of memory dubbed GDDR5X that allows for whopping 10Gbps speeds. No, that’s not as fast as the cutting-edge high-bandwidth memory found in AMD’s Fury graphics cards, but HBM is currently limited to 4GB capacities and GDDR5X is still plenty speedier than the GTX 980’s 7Gbps memory. You can find the full set of announced GTX 1080 tech specs on Nvidia’s website if you’re interested. 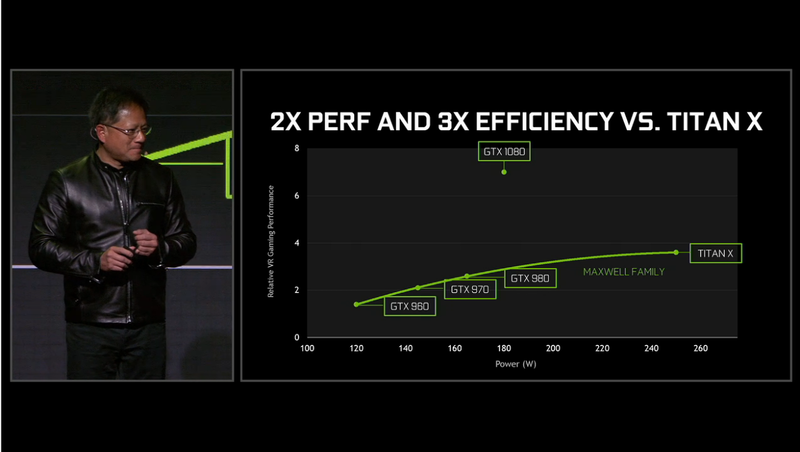 Beyond enabling eye-watering performance, those technological leaps have helped the Pascal architecture become Nvidia’s most energy-efficient GPU yet: Nvidia says the GTX 1080 boasts three times the efficiency of the Maxwell GPU-based Titan X. Yet despite offering more performance than dual GTX 980s, the GTX 1080 only demands 180W of power over a single 8-pin power connector. That seems like it shouldn’t be possible—powering a pair of GTX 980s demands the use of four 6-pin power connections, by comparison. But the there’s still plenty of overclocking headroom for people who want MOAR POWER hiding behind that modest power draw. 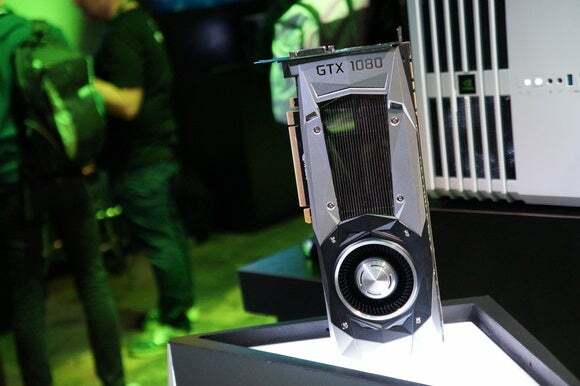 While the GTX 1080 offers clock speeds hundreds of megahertz higher than the GTX 980 out of the box—with a max boost clock of 1733MHz—Nvidia showed a Paragon demo running on a GTX 1080 overclocked to a blistering 2114MHz. And it was air-cooled, and still running at a comparatively chilly 67 degrees Celsius. Another one of SMP’s tricks can supercharge traditional one-monitor gaming, too. In a nod to the way VR headsets render scenes, SMP renders the edges of a scene at lower pixel resolution, since it’ll get all warped and scrunched together through a VR headset’s lenses anyway. Since the GPU’s rendering far fewer pixels, you see a big frames-per-second performance boost. You can still use that technology on a single monitor and see similar performance gains, and with less visual degradation than you’d expect. 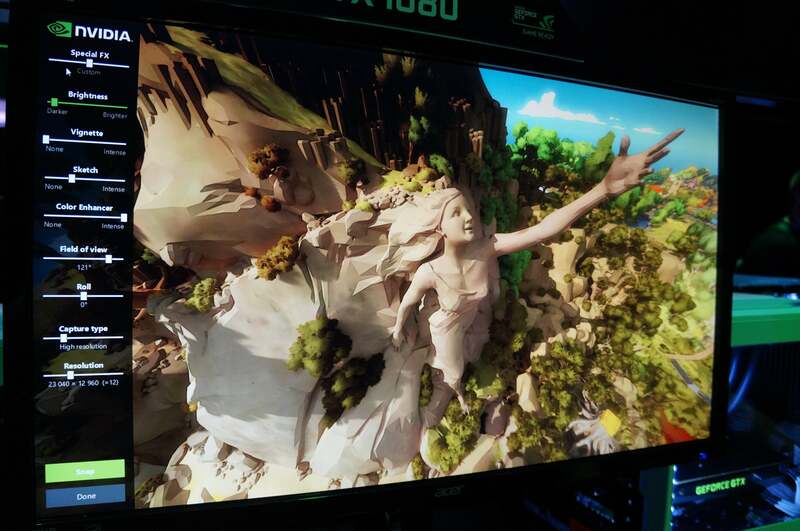 I played a demo of Cyan Worlds’ Obduction (at 4K resolution) that let you toggle SMP on and off; in a scene where frame rates hovered around 42fps, enabling SMP jacked it up to the monitor’s 60fps maximum, and you couldn’t see any blurring or artifacts around the edges of the screen unless you were standing still in-game and really looking for it. The developers said that enabling SMP can provide a 30 percent or higher frame rate boost in the game, depending on the scene. Exciting stuff, all built on the shoulders of Nvidia’s multi-resolution shading. A scene from The Witness captured in Nvidia’s Ansel. Nvidia’s looking to bring more art to screenshots with Ansel, an in-game 3D camera utility that lets you capture screenshots and then manipulate numerous filters, brightness levels, and other options to create the gaming masterpiece of your dreams. You can even use a free camera mode in Ansel to go places you normally wouldn’t be able to travel in-game, and at crazy high resolutions—up to 61440x34560, even if the game doesn’t support it. You can even take 360-degree “bubble” pictures that you can then check out on your HTC Vive or Google Cardboard headset. Awesome stuff, if it takes off, since developers need to explicitly enable support for Ansel. 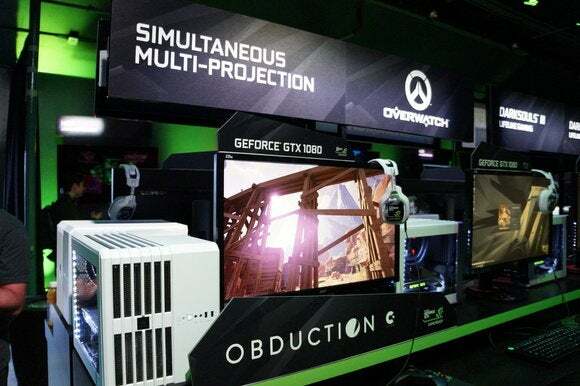 Existing games like Witcher 3 and The Division—both of which already featured Nvidia GameWorks tools—are slated to receive Ansel support, though, as does Cyan’s Obduction. Nvidia’s “Founders Edition” cards—previously known as reference cards—sport a new aesthetic that largely mimes the look of the GTX 900-series reference cards, down to the aluminum exterior and transparent front panel, but with a more aggressively angular design that brings tessellation triangles to mind. ...for slightly more than you might think. While “reference card” previously meant entry-level (despite the stunning build quality of Nvidia’s reference boards), the GTX 1080 Founders Edition will cost $700 when it launches on May 27, compared to an MSRP starting price of $600 for the GTX 1080. 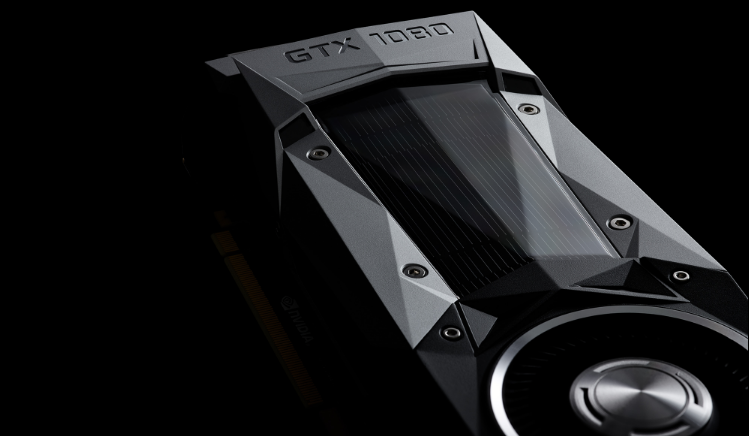 The GTX 1070 will cost $450 for an Nvidia Founders Edition when it launches June 10th, or just $380 at its suggested starting price—and yes, that’s despite outpunching a Titan X. 10) What’s AMD up to? Finally, the most important thing to keep in mind with the GeForce GTX 1080 is that we haven’t seen details about Radeon graphics cards based around AMD’s new Polaris GPU yet, which is also moving to a smaller (14nm) manufacturing process bolstered by FinFET. Early demos with low-power Polaris GPUs suggest AMD’s seeing a major efficiency bump from the transition too, though Team Red’s yet to tease anything with the raw firepower of the GTX 1080 and 1070. It’s going to be an exciting couple of months for gamers.